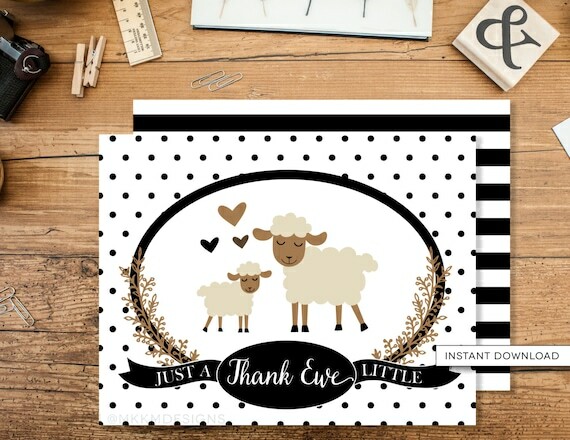 Say thank you in style with our little lamb themed "Thank Ewe" cards. These sweet black, white and brown cards are perfect for a note of thanks after your baby's shower. ►PDF and JPEG files of PRINTABLE DIGITAL Thank You Card, no printed items will be mailed to you. This Listing is NOT customized. Folded Thank You Card measures 5.5x4.25" when folded (A2 size), actual size is 5.5x8.5" flat. PDF is set up as 1 thank you card on an 8.5x11" page.